in a beautiful country house. Pengwern is a charming non-smoking country house built of Welsh stone and slate situated approximately 1 mile south of Betws-y-Coed in the Snowdonia National Park in North Wales. Offering quality bed and breakfast accommodation, it stands on the edge of its own wild woods with views to the magnificent Lledr valley, one of the most beautiful in Wales. According to local records a farm dwelling has been on this site since pre 1800 and during the early Victorian era was transformed into a country house. 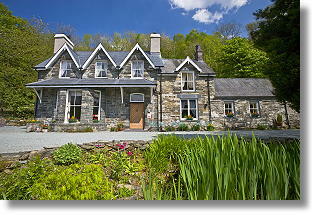 It now offers bed and breakfast accommodation just outside the village of Betws-y-Coed in the Snowdonia National Park. 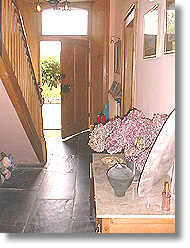 A warm welcome is assured from your Welsh speaking hosts Ian and Gwawr Mowatt as soon as you enter the slate floored entrance hall of this comfortable country house. The lounge to your left, and dining room to your right, both with wood burning stoves, provide warmth and comfort and the lounge is a relaxing area to enjoy complimentary welcome refreshments. Pengwern makes extensive use of Welsh produce. 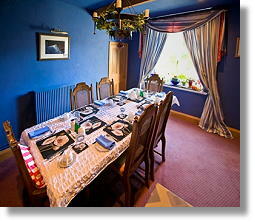 A Welsh breakfast is cooked by Gwawr using local produce, and a selection of locally produced yoghurts, preserves and home made fruit compote are offered. The dining room (left), and lounge (below) reflect the artistic past of the house. 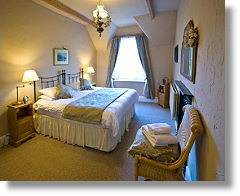 Upstairs, the beamed bedrooms and ensuite facilities are beautifully furnished and in order to maintain Pengwern's artistic history, each bedroom has been named after an artist which resided at the house during the mid to late 1800s. 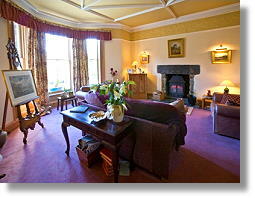 Wi-Fi internet access is available in all rooms. Large elegant super-king (6’) double or can be configured to twin bedroom (room sleeps max 2 people) with Victorian fireplace, views of Lledr Valley, separate dressing area with steps to ensuite facilities. 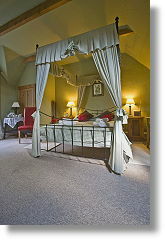 Large room with romantic wrought iron four poster bed and en-suite bathroom. Views to the side of the house. 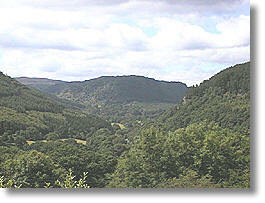 The house has 2 acres of wild woods, overlooking the beautiful Lledr Valley. It is easy to imagine how the views from the house (right) inspired the painters who resided in the house in Victorian times. 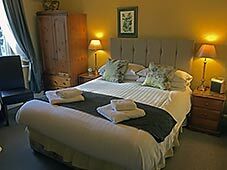 Attached to the house there is a superbly furnished self catering holiday cottage available for letting.